How do you review an operating system that most of you have no experience with, and which does a lot of things very differently from how other operating systems do? Remember that the AmigaOS’ heritage is as old as that of Windows and the Mac OS, which means that a lot of things that seem odd to a newcomer (like me) are perfectly normal for those that have a long love affair with the Amiga. As such, I think it would be wise to cover some of the what I would call idiosyncrasies of the AmigaOS first. Such a section can only start with the odd and rather strange way the AmigaOS handles windows. Clicking a window in AmigaOS 4 will not bring said window to front; it will just activate it. Consequently, you can actually drag windows behind other windows; you need to click the right-most icon on the title bar to actually bring the window to front. This has to be one of the most annoying things I have ever encountered in window management, since having to hit that small little button every time I want to switch to another window started to get on my nerves real fast. Luckily, AmigaOS 4 comes with a small utility called Click-to-Front which allows you to bring any window to front by double clicking anywhere in the window. I dumped this utility in my start-up directory so it would be loaded upon boot. Obviously, I come from a different world; for Amiga users, this is normal behaviour. As such, it’s not that it’s inherently bad behaviour, it’s just different. The AmigaOS 4 doesn’t come with a taskbar or a dock which indicates which applications are running. It does have the AmiDock, but this lacks running indicators. Luckily, however, the AmigaOS makes use of iconification, my personal favourite method of managing running applications. You can iconify any window, turning them into an icon on the desktop which you can then move around and manage as if they were normal icons. Anyone who has ever used CDE will know what it means. Iconification makes you treat applications in a different way: as single entities, manipulated from one location: the window itself, either full or iconified. This feeling is strengthened by the way Amiga handles a window’s menu bar – there is none. Well, it’s hidden. You can bring it up by either right-clicking on the window decoration, or the “bar” atop the screen. Another feature unique to the Amiga is its draggable screens. You can have multiple “screens” defined, and you can run applications on each of those screens. You can then drag your current screen downwards (or any other direction, you can configure this) to reveal the screen running “behind” it. These screens can have different themes, different resolutions – it’s all very advanced. Sadly, I also found it very difficult to configure, and only got it to work with a small number of applications. What AmigaOS needs is a few default screens set-up, and the ability to drag and drop windows from one screen to the other. Currently you have to manually configure windows to appear on certain screens, and while this is useful for running, say, old Amiga games, it’s not very user friendly for new users like me. The feature has a lot of potential though, so I hope the AmigaOS developers can capitalise on it more in the future. 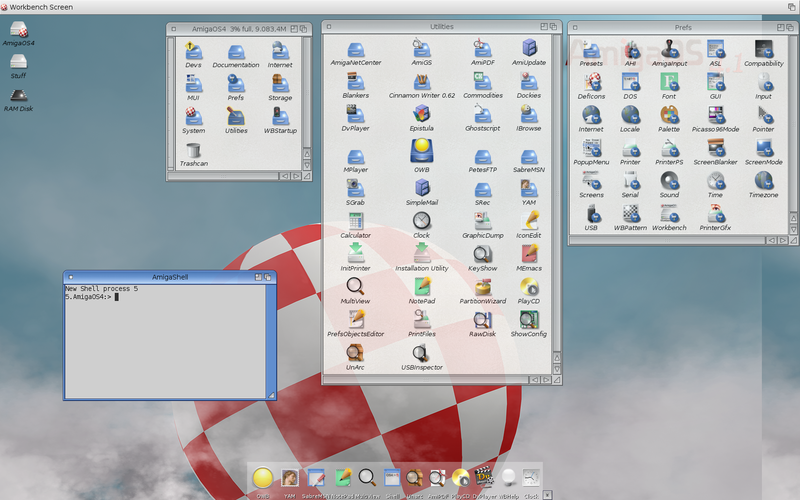 Another change is that technically, the AmigaOS doesn’t make use of the desktop paradigm. I say “technically”, because essentially what the difference amounts to is a different naming scheme for objects you’re already used to. The desktop becomes a workbench, directories become drawers, programs become tools, your files (images, documents, etc.) become projects, and so on. While essentially just a naming scheme change, it does take a bit of getting used to because the names you’re used to aren’t there. Good luck trying to find a “file” menu; it’s called “project” in AmigaOS. I want to apologise in advance to any die-hard Amiga fans if in this review I unintentionally use any desktop metaphors. You’ll also encounter something called the RAM disk, which is exactly what the name implies. You can use this as a temporary storage location, but as this is RAM we’re talking about, it’s not persistent across reboots. I now want to move on to a very specific part of the AmigaOS experience that drove me completely and utterly nuts, up to a point where I wanted to tear my hair out: the file manager. Yes, this really deserves its own section as I found it the weakest point of the experience. I think the most ire I have towards AmigaOS 4.1 is reserved for the file manager. I have some serious issues with the way it displays and handles files. Mind, though, that I’m not talking about Amiga doing things differently from the rest of the world – I’m perfectly fine with that. No, my issue is with AmigaOS 4.1 having a severely broken spatial file manager implementation. You see, contrary to common belief, a spatial file manager amounts to a whole lot more than just opening each folder in a different window. The name actually already implies the most important aspect: it’s spatial, meaning that you should be able to rely on your spatial memory to find and locate files and folders drawers. A core aspect of this is that each individual folder/drawer remembers the way its contents are laid out. And this is where AmigaOS severely breaks the paradigm. No matter what I do, change, or move around, it will never remember where files are put. Drawers will remember their windows’ sizes and locations, but never the locations of the files inside it. This might seem like a small niggle, but in practice it is very annoying. Say you tell a drawer to order files by type, and then you tell it to resize-to-fit. Great, all icons visible, window has the right size. Then, you close the drawer, and re-open it: the window size will still be the same (not always though), but files will be in different locations, and most annoyingly – file and file names will overlap, and files will be placed in such a way you need to scroll. This makes browsing through your drawers an absolute pain in the bum. I have no issues with the spatial paradigm, but a problem with said paradigm is that it is very easy to implement it wrong, and a wrong implementation will quickly lead to frustration. I personally do believe that a well-implemented spatial file manager is superior to a navigational file manager (all hail the OS9 Finder!) – it’s just that it’s so hard to implement that basically everyone gets it horribly, horribly wrong. Sadly, the AmigaOS is no exception to this rule. Mac OS 9’s spatial Finder was absolutely spot-on perfect in that regard, and I’ve yet to find any other good spatial file manager – Workbench isn’t one of them, sadly. Not by a long shot. This is the spatial paradox: it’s the easier to use paradigm (for me, at least), but it’s infinitely harder to get the implementation right. In addition to the problems above, the file manager also doesn’t auto-update its contents; you need to manually update a folder if you downloaded something new into it. There are 3rd party utilities that fix this problem, but I’d prefer it something as basic as this is part of the default installation.